As a newbie to Linux, using Ubuntu Netbook Remix gave me some trouble. Because I found that, when I plug in the USB pendrive, there is no response. So I cannot mount it manually, and there is no information in /dev drive. Search for a long time for the solution, study a lot, read the forum. I found some solution like “udev”. However, I already installed udev, but there is no detection found. Finally I join Ubuntu IRC to ask for information, but there is no solution yet. After I login to Ubuntu, then I plug in the USB pendrive. There is no response. I read the /var/log/messages, there is the detection of the USB as sdb. But I tried to look for the /dev/sdb1, but it is not existed. So, I can not mount the partition. So, I tried to use “fdisk -l”, right, there is no partition in sdb. And I tried to use “lsusb”, there is the information about my pendrive. This is annoyance. If I reboot Ubuntu without removing the pendrive, then the pendrive is automatically mounted. The udev is already installed. After joining the IRC, one of the friends ask me to logout then login. I haven’t tried it. But then, when I tried to do so, after inserting the pendrive, after a while, the pendrive is automatically mounted!(???!!) I also don’t know why. Then, I tried to plug in the USB mouse, but the mouse cannot detected automatically. So, though the USB pendrive is solved, USB mouse still not yet be solved. The problem I faced on UNR on HP Mini 1109TU is the Wireless Network driver. The Wireless device of HP Mini 1109TU is Broadcom Corporation BCM4312 802.11b/g. After the installation of UNR Karmic (9.10), there is no Wireless Network support. I cannot access internet with WiFi. So, the network cable is needed for internet connection. I have tried several ways to enable the Wireless Network driver. First, run the System > Administration > Update Manager to update everything (remember to find the fastest repositories). After everything is updated, reboot Ubuntu. Activate “Broadcom B43 wireless driver”, the wireless device was still no function. Then I activated “Broadcom STA wireless driver”, the computer freeze. So, I restart the computer manually. The wireless device was shown, including using “iwconfig” and “ifconfig” commands. So, this should mean that my wireless device was working. But I could not detect my router. Due to my foolishness, I right-clicked the network manager icon instead of left-clicked, so I could not see any wireless network. But finally, I accidentally used the left-click to get the list of wireless network. Then, connect it, open Firefox, surfing! Success! Windows Wireless Drivers. I had successfully installed the wireless network driver without freezing the computer using Windows Wireless Drivers. So, these are what I have done and now, I can use the netbook to access internet with Wireless Network connection. I haven’t tried Windows 7. But I am satisfied with Windows XP. 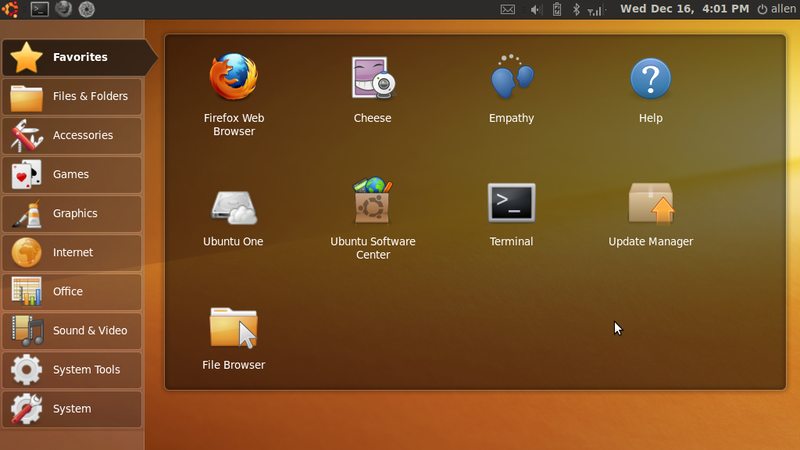 And now I got Ubuntu, and experience a new different OS. Good feeling! Feeling good! HP Mini 1109TU, Small and light. But netbook is not laptop, the screen resolution is smaller. Thus, cannot play some of the games. That is why there is HD (High Definition) HP Mini. Since my netbook have most of the software similar to my laptop, yet it cannot play the games like my laptop. The function of the netbook just become a redundancy yet deficiency. Since my works are primary done using my laptop, so I want to make something special to my netbook. Actually I want to try to install FreeBSD to my netbook. But, FreeBSD is not popular enough for the netbook, I think there will be driver problem. So, I try Ubuntu Netbook Remix. Again, because I am afraid of driver problem, I do not remove Windows XP of the netbook. But try to install two OSes to the netbook. Then I tried to install UNR (Ubuntu Netbook Remix) from the USB pendrive. Great! Installing from pendrive. The installation steps are far more easy than FreeBSD, everything is GUI. Finally, booting the computer with a boot loader so that I can choose my OS to run. Hahaha, I will explore more on the UNB next time. I have tried both SRWare Iron and ChromePlus, though not using as primary web browser. Because of the WMA problem, I prefer SRWare Iron. But I think these features can all be integrated in future, because Chromium 4.0 is still in beta version. This post is too old. Latest ChromePlus and SRWare Iron fix the Windows Media Player problem I mentioned. Besides, Ctrl+Shift+Del can clear the cache and history. And latest SRWare Iron uses Chromium 4. Now, technology aims to cloud computing because of the importance of social networks. Especially the services like Facebook and Twitter. Besides, Google produces Chrome OS so that everything can be done through Internet. No installation of office suite, one can create documents, spreadsheets, presentations, etc. Next, synchronization of the documents, bookmarks, personal profile or profile setting becomes important also. Google Chrome 4.0 provides built-in bookmark syncing. Not only Google Chrome, but Opera 10.10 also provides similar feature: Opera Link and Opera Unite. Opera Unite allows file sharing; Opera Link allows syncing bookmark and other settings. Firefox doesn’t have these built-in feature. But it is supported by the extension, such as Xmarks. Xmarks not only works on Firefox, but also on IE and Safari. Great! What else? Even Ubuntu provides Ubuntu One service. Allows you to sync and share your files. Great great!!! Previously on Allen’s Blog (I like this phrase), I talked about Google Chrome alternative. There are more, Portable Chrome from PortableApps and ChromePlus. Now I am trying on ChromePlus, it uses Chromium 4.0. That means it can install with the extensions like Firefox. Maybe the extension developers will port the Firefox extensions to Chrome, then Chrome can act like Firefox.